MacIntosh Management is building new nursing home in Canal Winchester. 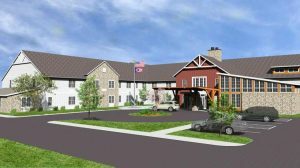 A Central Ohio owner-operator of five nursing homes is growing by 40 percent in less than a year: MacIntosh Management Company LLC acquired a nursing home June 1 and is building new in Canal Winchester. President Curt Anderson said the 32-year-old for-profit company is able to expand amid fluctuating reimbursement rates from government insurers because it can get economies of scale from operating many properties, like the larger chains, while occupying a customer service niche closer to nonprofit retirement communities that typically maintain higher ratios of staff to residents. “I’d like to think we’re in between (big chains and nonprofits) from a business model standpoint,” he said. Construction is expected to start by late summer on a $15 million facility with 75 skilled nursing beds and 35 assisted living apartments, on 7.5 acres in a largely residential neighborhood on East Gender Road, a few blocks south of Groveport Road. The 87,000-square-foot complex expected to open in mid-2017 will create about 110 jobs. MacIntosh commissioned a market study and guessed the consultants would recommend suburbs to the north or northeast, Anderson said, but the top choice was Canal Winchester. “That’s one of the last communities around (Interstate) 270 that has the land and ability to grow,” he said. MacIntosh also acquired the 100-bed Columbus West Park Nursing and Rehabilitation Center in the city’s Westgate neighborhood when past owner Tom Stewart retired. It purchased the real estate for $3.4 million, but there was an additional undisclosed amount for the business assets. MacIntosh took on the center’s 115 employees and renamed it West Park Rehabilitation Center, Skilled Nursing and Memory Care. “We’d been strategically thinking about expanding,” Anderson said, when a broker approached about the center’s imminent availability. “We weren’t out actively knocking on doors,” he said. MacIntosh used a bank loan for the acquisition and is financing the construction with Columbus investment banking firm Lancaster Pollard. The Canal Winchester project was made possible by shifting 75 state bed licenses from the company’s Whetstone Rehabilitation Center across the street from OhioHealth Riverside Methodist Hospital. That facility was licensed for 200 beds in semiprivate rooms, but is converting most of its rooms to private and had excess licenses. Its other locations are in Hilliard, Grove City, New Albany and Circleville. MacIntosh also runs a home health service.